Early Risers can profit from a unique sunrise through misty clouds just in front of the tourist lodge. 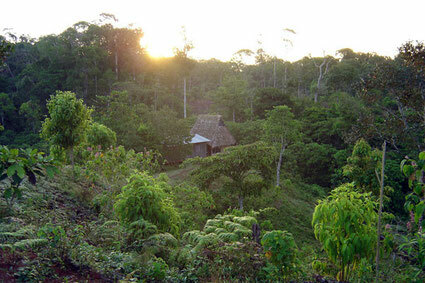 During the dry season the tropical rainforest at this sea levels gets its humidity from the clouds and the mist. The screaming of the toucans and parrots that are sitting high above in the canopy might wake you up. The more adventurous among you will get the chance to do some trips through the wilderness of our forests. Accompanied by our guides you will walk through the shady floors under the huge trees and you will be rewarded with some unforgettable impressions of Costa Rica’s nature. We are sure that you will leave the Tamandu Lodge with lots of interesting impressions on your mind, as we offer you a wide range of diverse activities. It can be a long trip through the wonderful rain forest, a bathe in the clear river or an introduction to the culture and handicrafts of the Guaymies, just as you like. There are many opportunities waiting for you. We would be pleased to talk to you and arrange a program that suits you best.